Congratulations to Ian Bailey who has caught the largest spring fish on Tweed so far this year at 34lb on the famous Tweed beat, Junction and wins the Borders Gun Room FishTweed Fish of the month. 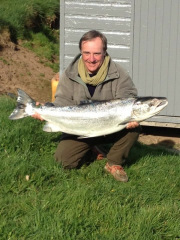 The spring salmon was caught on a Flying C and took 10 minutes to land, Mr Bailey initially thought the fish to be about 25lb, before it was measured, 104cm in length and weighed 34lb. Bill Quarry who is currently writing a book on salmon, believes Mr Bailey’s salmon to be the biggest spring fish since the 1920’s from Tweed. Mr Bailey’s party were fishing Junction and Carham, and had 14 fish for the week, including a first fish for beginner Mrs Paterson. Congratulations to all concerned. FishTweed Largest Salmon Competition is run in conjunction with Borders Gun Room of St. Boswells for the largest salmon caught each month for the whole of season 2013 from the FishTweed beats. The winner receives a £50 worth Borders Gun Room gift voucher. Please note that fish will only qualify, if they have been timeously reported, and the beat regularly reports catches to FishTweed. Judges ruling is final.